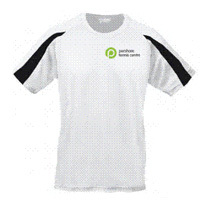 AWD Junior contrast wicking tshirt with Pershore Tennis Club logo on the front left chest and club logo on the rear. Contrast inserts on front and back of sleeves. Printed/tear out label (some colours in transition).